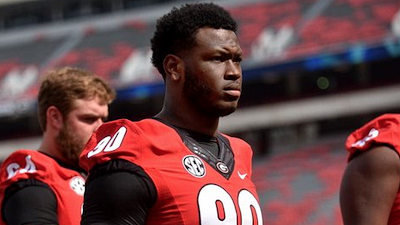 Shirts With Random Triangles: Georgia DL Chauncey Rivers Dismissed After Third Arrest On Charges Of Marijuana Possession. The arrest occurred in DeKalb County, Georgia. Details are scarce, but the biggest of the four charges Rivers is facing is described as "a felony violation of Georgia’s Controlled Substance Act." Other charges include "possession of less than an ounce of marijuana, parking in a disabled parking spot, and keeping drugs in a container." Rivers is already facing a three-game suspension for the start of the 2016 season due to his previous arrests in November and December of last year. He was also suspended for Georgia's appearance in the 2016 TaxSlayer Bowl. This new arrest will probably mark the end of Rivers' career as a Georgia Bulldog.